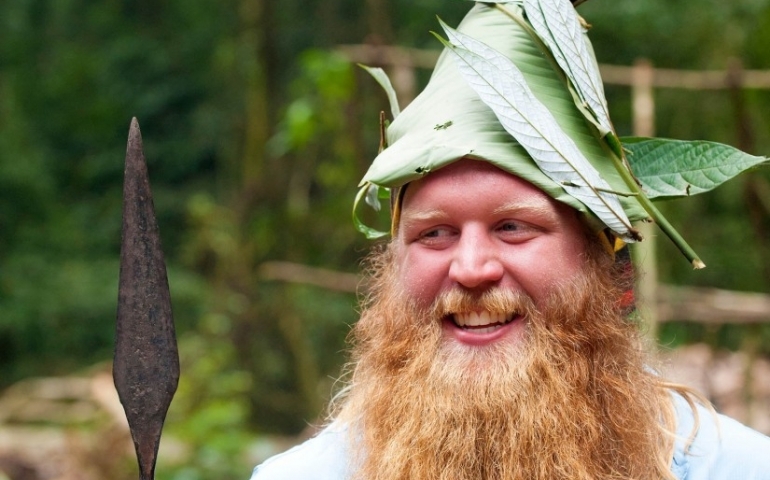 When Justin Wren stepped in the ring August 28th, it was his first time back in five years. For Wren, it was different this time; he wasn’t fighting against people–he was fighting for people. Standing at 6 foot 4 with a long blonde beard, mixed-martial artist Justin “The Viking” Wren found himself stepping away from what he loved to make a difference in the lives of the forgotten. He moved to a remote African village in the Congo, living among the Pygmies and witnessing the oppression from surrounding tribes. In his new book Fight for the Forgotten, Justin covers his experiences, sharing faith, redemption, freedom and his love for his newfound family, the Pygmies. Like most kids, Wren was subject to bullying when he was growing up, but he kept his dream to be a UFC fighter alive. Fueled by anger from his tormentors, Justin worked hard to make his dream a reality. But suffering from his childhood never seemed to go away, sending him into a state of depression and addiction. After being kicked out of his training group and his career falling apart, Justin found himself with nowhere else to turn. It was at that time a friend reached out to Wren and invited him to a men’s retreat, where he found God. As Justin began to put his life back together, he had the opportunity to travel with many international mission groups, which opened his eyes to the pain and suffering found in the jungle of the Democratic Republic of Congo. It was there he met the Mbuti Pygmy tribe, or as Justin describes them, “the most bullied people on the planet.” They are a village of people enslaved by surrounding tribes. Wren wondered who would help them, and it was then when he stepped out of the ring and stepped into the fight for the forgotten. For five years, Justin has helped the Pygmies regain their freedom. He teamed up with Water4 to help bring clean water to not only the Pygmies, but the surrounding villages, portraying a beautiful image of what it means to love your enemies. This eventually led to the Pygmies’ freedom. Justin has been training since he last visited Southern Nazarene University to speak to students during Human Rights Awareness Week, where he helped raise $2,000 (with students) last fall semester. The money raised is being used to put in Water4 wells. Wren stepped back in the ring August 28th to help give the Pygmies a voice. All of his winnings will be going to support the Pygmies, bringing them sustainable life. Justin plans to help the Water4 theme house in raising $15,000 to start a Water4 drilling team. He also plans to visit SNU again in the spring semester to help raise awareness. Justin’s book, Fight for the Forgotten, will be available September 15, 2015.